Surabaya (beritajatim.com)--Penataan alat utama sistem persenjataan (Alutsista) mulai berjalan di lingkungan TN I-AD. Saat ini, sebanyak 29 unit kendaraan tempur jenis Tank AMX-13 yang sebelumnya berada di Yonkav 3/AC, telah dipindahkan ke Kodam XII/Tanjungpura, Jumat (29/12/2017). 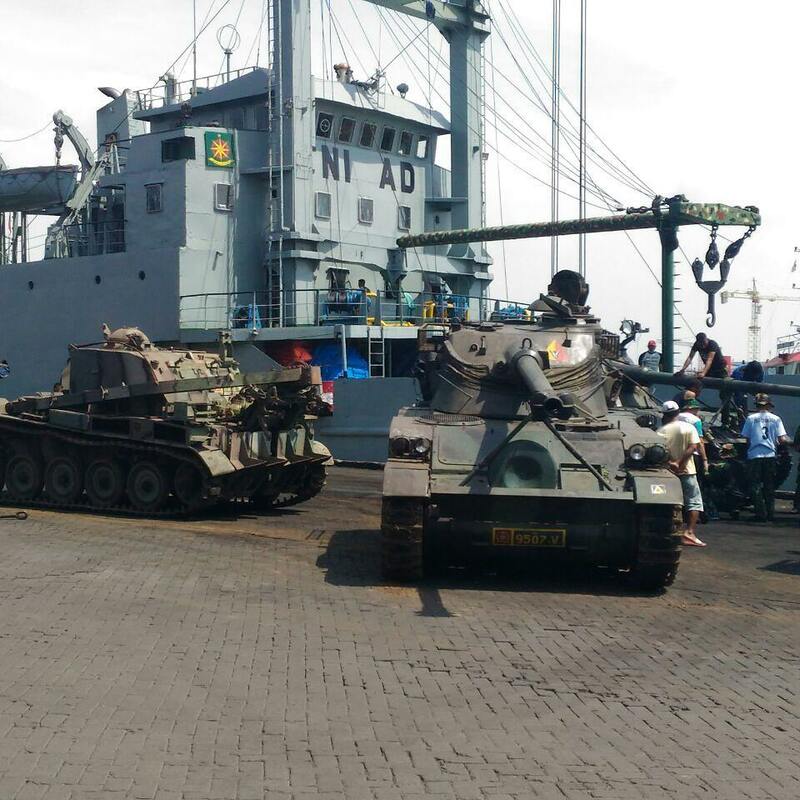 Tank itu diangkut dengan menggunakan kapal ADRI XLIX, yang sebelumnya telah berlabuh di Pelabuhan Tanjung Perak, Kota Surabaya. Letkol Cba Ir. Kahardi. M. T., M. D.M. menuturkan, pemindahan ranpur tersebut telah dimulai semenjak tanggal 15 Desember lalu. Pemindahan itu akan terbagi menjadi beberapa tahap. "Total seluruhnya ada 29 unit, tahap pertama sejumlah 14 unit pada tanggal 15 Desember dan tahap kedua sebanyak 15 unit pada 29 Desember 2017. 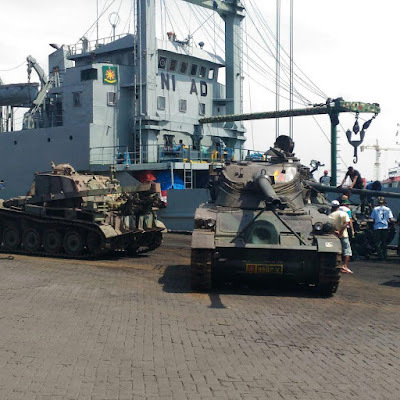 Pemindahan ini bertujuan untuk memenuhi kekuatan Alutsista ranpur di Yonkav 12/BC,” ungkap Kepala Terminal Pembekalan Angkutan-2 (Termbekang) ini. Selanjutnya, kata Kahardi, beberapa unit tank tersebut nantinya akan berlabuh ke Pelabuhan Dwikora, Pontianak terlebih dahulu sebelum dikirim ke lokasi tujuan (Yonkav 12/BC).“Sesampainya di sana, kondisi tank akan dicek ulang,” tuturnya. 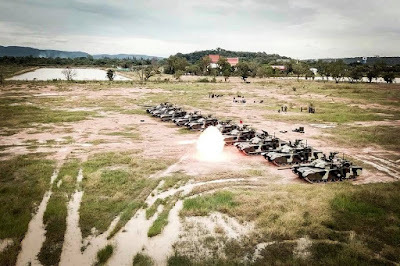 Selain ranpur jenis Tank AMX-13, beberapa alutsista juga dikirim oleh Terbekang-2 Surabaya guna menunjang kinerja Satuan Yonkav 12/BC, termasuk di antaranya ialah beberapa koli amunisi, alhar, sekaligus senjata dan laras cadangan. Perlu diketahui, Termbekang-2 merupakan satuan pelaksana Direktorat Pembekalan Angkutan Ankatan Darat yang memiliki tugas pokok satuan, yaitu menyelenggarakan embarkasi dan debarkasi materiil dan personel TNI AD melalui Pelabuhan Tanjung Perak, Surabaya. President Rodrigo Duterte has approved the budget to fund the transfer of Republic of Korea (ROK) Navy Flight III Pohang-class corvette ROKS Chungju (PCC-762) to the Philippine Navy, this was revealed by MaxDefense Philippines on December 28, 2017. According to MaxDefense, citing some sources, the announcement was made during the Offshore Combat Force’s year-end party over a week ago. “Pres. 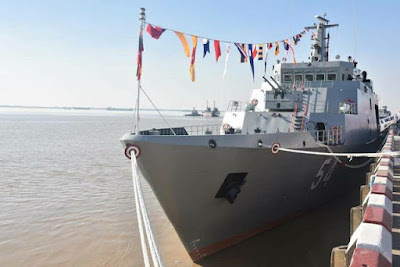 Duterte is said to have signed the DBM recommendation and order to release funding for the transfer of the former ROKN Flight III Pohang-class corvette ROKS Chungju to the Philippine Navy worth Php250 million,” MaxDefense said in its social networking page. “The officers, men and women to man it would be sent to South Korea by January 2018,” MaxDefense added. “The PN would be getting the Chungju as it is, except for removal of some ROKN-only equipment and replacement of obsolete items like the navigation radar. 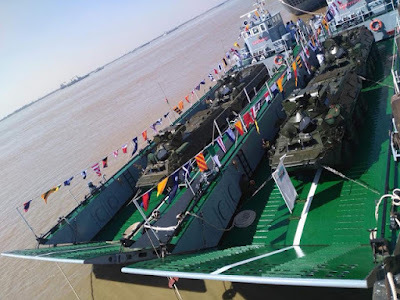 But the ship in its pre-retirement form still has its 2 Oto Melara 76mm Compact guns, two twin Otobreda 40mm guns, two triple lightweight torpedo launchers, among others. The PN’s budget request also include acquisition of ammo for these guns,” MaxDefense said. The Offshore Combat Force is operating under the Philippine Fleet of Philippine Navy. RILIS.ID, Ambon— Mabes TNI-AU memprogramkan pembangunan skuadron F-16 di Ambon, Maluku, pada tahun anggaran 2018. 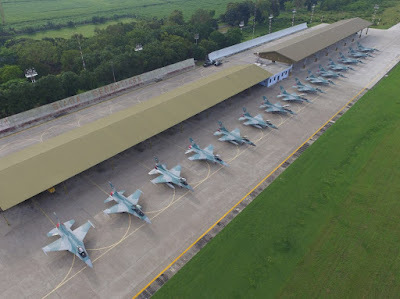 TNI- AU saat ini memiliki dua skuadron udara yang mengawaki pesawat F-16, yakni skuadron udara di Lanud Iswahjudi, Madiun, dan Skuadron Udara Lanud Roesmin Nurjadin, Pekanbaru. Jakarta -- Komando Latihan (Kolat) Koarmabar melaksanakan uji fungsi Integrated Combat Management System (ICMS) yang disaksikan oleh Irum Itjen TNI Marsekal Pertama TNI Sri Pulung di Puslat Kaprang Gedung Bambang Soesilo Kolat Koarmabar, Jakarta Pusat, Kamis (28/12). 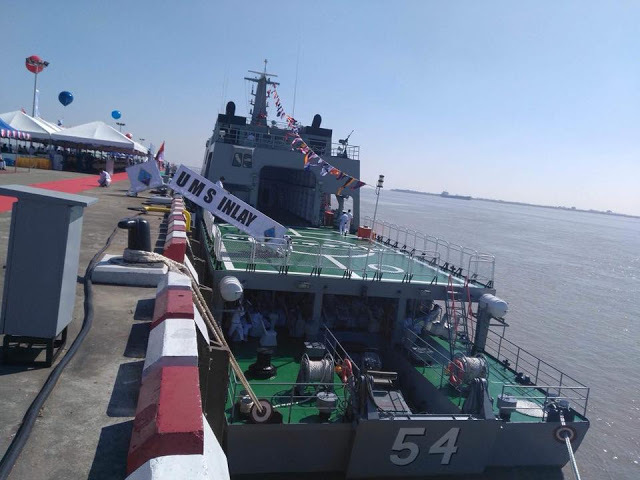 The Myanmar Navy commissioned seven new vessels into service on 24 December 2017, the service’s 70th anniversary. The vessels included an offshore patrol vessel (OPV), named UMS Inlay (54), two 56 m landing craft utility (LCU) vessels (1614 and 1615), as well as four 29 m landing craft tank (LCT) vessels (1713–1716). 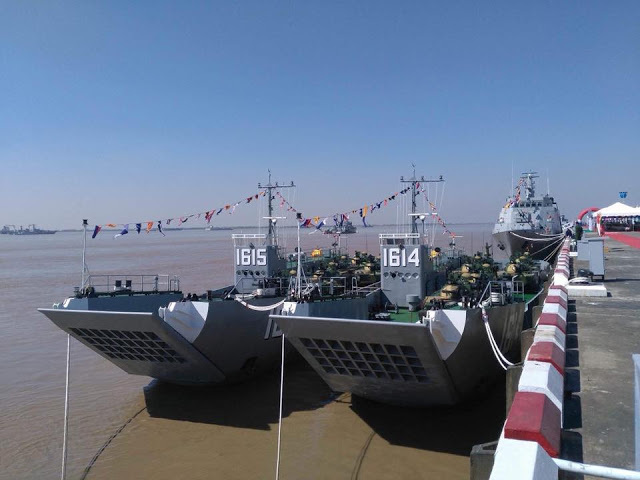 Inlay was built at Thanlyin Naval Dockyard near Yangon with the help of technical assistance and equipment provided by Singapore-based companies. Launched by late November 2015, Inlay had been very largely completed by April 2017. The OPV is approximately 81 m long with a beam of about 12.5 m and is understood to displace at least 1,500 tons. 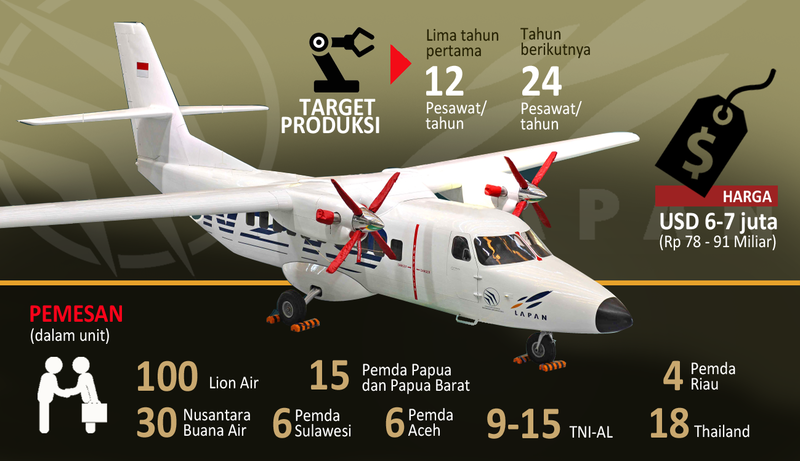 BANDA ACEH (RA) – Pemerintah Aceh berencana membeli pesawat terbang jenis N219 produksi PT Dirgantara Indonesia (PT DI), dengan opsi untuk mengembangkan fasilitas produksi N219, kedirgantaraan serta antariksa di Aceh. Merespon rencana tersebut, PTDI akan memberikan proposal terkait dengan pembentukan fasilitas final assembly lines N219, termasuk program pengembangan SDM putra daerah Aceh dalam bidang industri kedirgantaraan . Jakarta (ANTARA News) - TNI Angkatan Laut resmi diperkuat armada baru, yakni satu unit Kapal Angkatan Laut (KAL) 28 M dan dua unit Combat Boat AL D-18 produksi PT Tesco Indomaritim melalui upacara serah terima tiga kapal yang dipimpin Asisten Logistik (Aslog) Kasal Laksamana Muda TNI Mulyadi, di Pantai Mutiara, Jakarta Utara, Rabu. The Department of Budget and Management (DBM) has released the Special Allotment Release Order (SARO) for the acquisition of 16 brand new combat utility helicopters (CUHs) for Philippine Air Force (PAF). SARO-BMB-D-17-0025076 approved December 20, 2017 for the said acquisition has an amount of PHP12,073,122,578.00. “Release of funds to cover the acquisition of 16 units of Combat Utility Helicopters (CUHs) under the Revised AFP Modernization Program (RAFPMP),” the DBM said in SARO’s purpose. “The helicopter to be acquired are additional Bell 412 helicopters although the exact variant (EP or EPI) is still to be determined,” MaxDefense Philippines said in its social networking page. MaxDefense said the mode of procurement will be government-to-government transaction between Philippines and Canada through the Canadian Commercial Corporation (CCC). 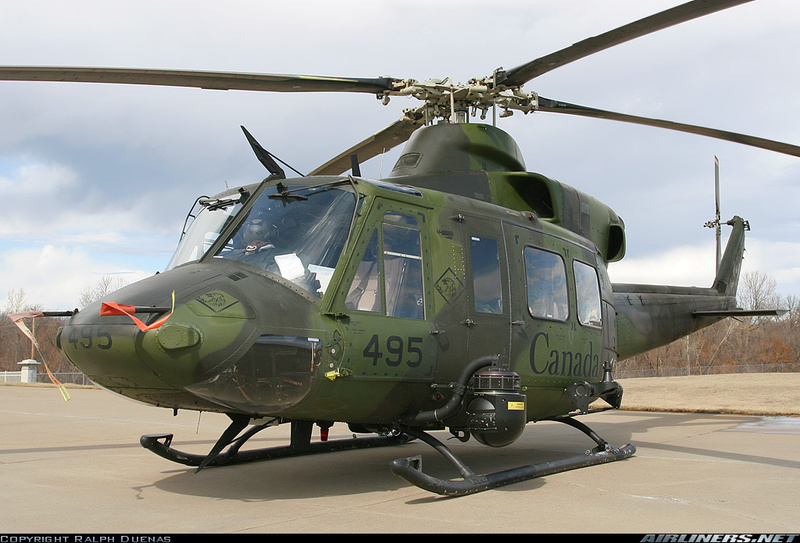 The most recent acquisition of Bell 412EP helicopters for PAF from Bell Helicopter Textron Canada was in 2014. Mode of procurement was also via government-to-government negotiation through CCC. Eight helicopters were delivered and accepted mid-2015. Saab has received an order for support of algorithm development and evaluation of airborne AESA radar for South Korea’s indigenous KF-X fighter jet. 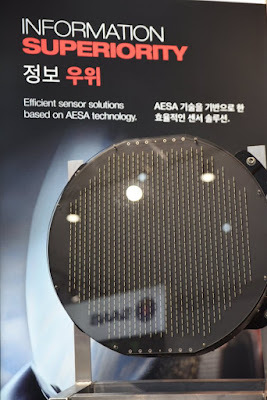 The radar development programme is led by the Korean Agency for Defence Development (ADD) and Saab will work in cooperation with ADD and its contractual partner LIG Nex1. The order value is MSEK 125 (US$25 million). 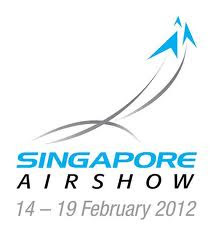 “We are proud to be part of the airborne AESA radar development program. This further proves our position as the leading provider and partner to develop the latest fighter aircraft technology and sub systems”, says Anders Carp, head of Saab’s business area Surveillance. “One of our objectives is to partner with Republic of Korean industry and government to support the development of a domestic fighter”. Seoul was developing its locally-made fighter jet, initially named as KF-X, with support from Lockheed Martin but the US government denied it four critical technologies including that of the AESA radar. 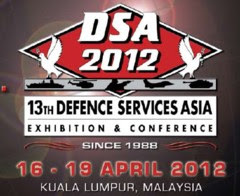 The AAD then vowed to develop the technologies on its own. South Korea has roped in Indonesia as a partner in the KF-X fighter jet program in which the latter is to fund a part of the program in exchange for the rights to manufacture some of the aircraft. JAKARTA - Komando Pertahanan Udara Nasional (Kohanudnas) tengah mengembangkan pertahanan anti pesawat nirawak atau Unmanned Aerial Vehicle (UAV). Kebijakan ini sebagai langkah antisipasi munculnya ancaman dari pesatnya teknologi. On the news program 19:00 pm on December 22nd on VTV1 channel, the Vietnamese Navy has for the first time announced image launched of Club-S cruise missile from Kilo submarine. On the occasion of the 73rd anniversary of the founding of the Vietnam People's Army, VTV has made a special report on the Vietnam Naval Forces, the evidence of most modern of the Vietnamese Navy and most modern evidence of our army. Over five years of development, the Navy has now become one of the main forces along with the surface and submarine forces to strengthen the national sovereignty over the sea. Submarine helicopters or seaplane of the Naval Air Force are working day and night, contributing to the sovereignity islands in the open sea. 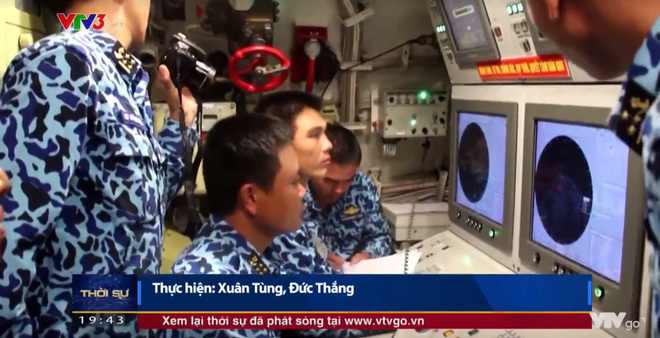 In addition to introducing our Navy Air Force, VTV's report also shows that part of the Navy's naval forces, the fists of the sea, is the deterrent force of our navy before hostile forces outside. 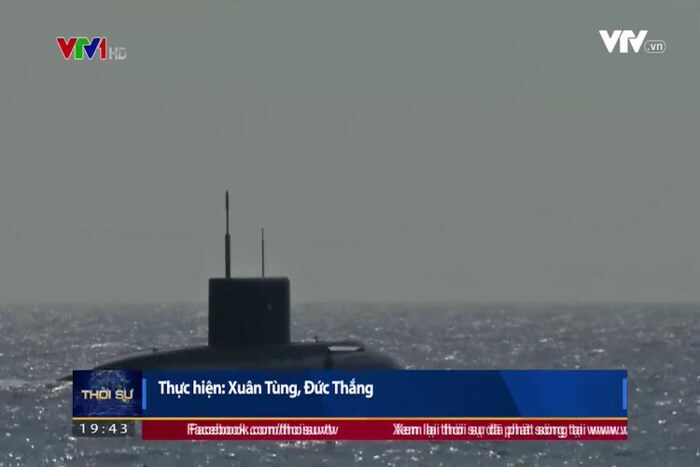 The most prominent is the 3M-54E cruise missiles that are being equipped on the modern Kilo diesel-electric attack submarine of the Vietnamese People's Navy. 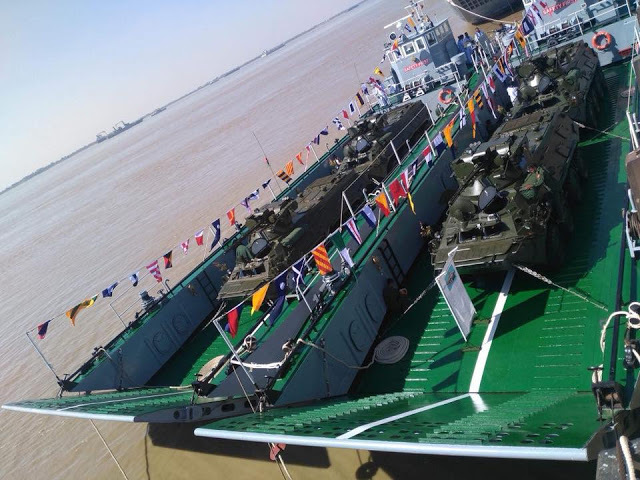 In addition, our naval surface ships are equipped with advanced anti-ship missiles such as Gepard missile or Molniya missile ships, the flagship ships of the Vietnamese Navy. In the reported release, both sides of the Molniya missile fleet launch a Uran-E type anti-ship missile variant, the export variant of the Russian anti-ship missile series Kh-35, which has a range that can be extended up to 300km and equipped with a 145kg warhead. Each Molniya vessel is equipped with up to 16 Uran-E misiles. 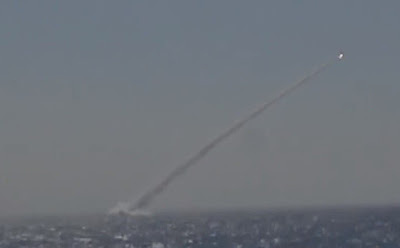 And last but not least is the previously unveiled image of a 3M-54E Club-S missile launch from the Navy's newest Navy Kilo submarine. According to the information released, the 3M-54Es of the Club-S system on Kilo Vietnam can destroy many targets and make the enemy unprotected. To launch a rocket when submerged underwater must follow two phases. At an immanent stage, the rocket will use a compressed air propulsion at high pressure, allowing it to push itself completely off the water for a few meters, when the new propulsion starts burning fuel. to perform the normal land-based discharge process. This launcher requires updating the launch location information for the computer system prior to startup, especially in terms of depth since the missile needs to be completely out of water to be able to ignite it. propulsion motors. Russian manufacturers said that the 3M-54E missiles of the Club-S system for the Vietnamese submarine Kilo also operate under this principle. 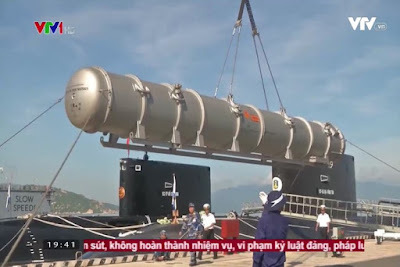 According to data from the Stockholm International Peace Research Institute (SIPRI), in 2009, Vietnam signed a contract with Russia to purchase 40 anti-ship cruise missiles 3M-54E Club-S. The 3M-54E supersonic anti-ship missile has a range of 300km, Mach 2.9 speed, and a 200kg armor-piercing shell. 3M-14E 3M-14E missile missiles reach a range of 275km, with a 400kg warhead. The 91RE1 anti-submarine missile has a range of 50km. The 91RE2 anti-submarine missile has a range of 40km. The 3M-54E anti-shipping missile weighed 2 tons, was launched from the 533 mm torpedo launcher, and fitted with a 200 kg warhead. The range of this missile is 300 km with subsonic speed. However, its final-flight speed can reach over 2,000 km / h.
The 3M-54E also has an aerial launch version and launches from surface ships. When the 3M-54E attacked warships, the speed at the final flight stage was accelerated, making the missile particularly dangerous. The last stage usually starts when the missile is about 15 km away. 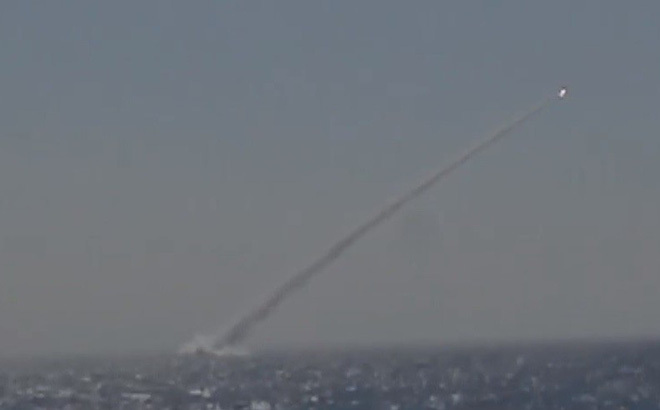 Before that, the flying height of the missile kept about 30 m. This makes the missile relatively difficult to detect. This feature combined with a very high final flight rate, so when the missile successfully flew last 15km less than 20 seconds. This makes the existing anti-missile weapon very difficult to shoot down it. 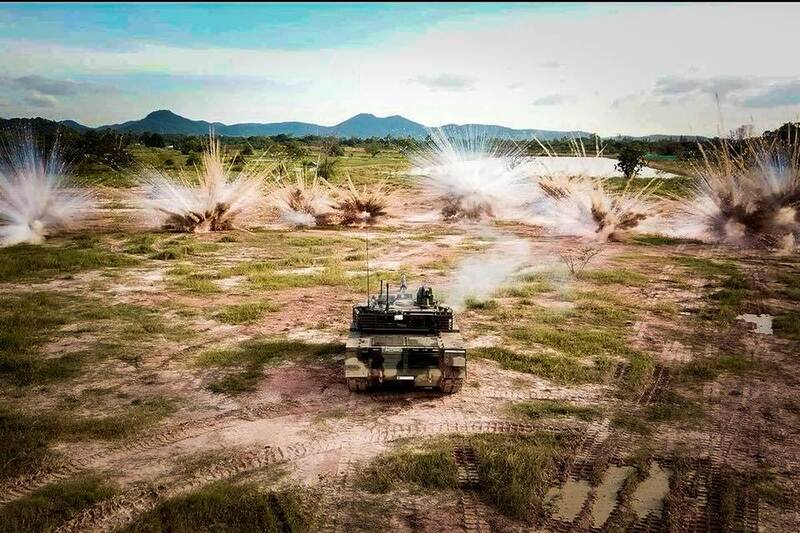 The Royal Thai Army has released pictures of its recently delivered Norinco-made VT4 main battle tanks (MBT) during live-fire military exercise. Since that time, the Royal Thai Army has received the first batch of 28 VT4 main battle tanks (MBT) produced by China North Industries Corporation (NORINCO). The procurement of the 28 Chinese tanks was approved early last year. According to Bangkok Post, the tanks were commissioned at the 3rd Cavalry Division at the Prem Tinsulanonda Military Camp in Khon Kaen’s Nam Phong after the completion of the inspection. 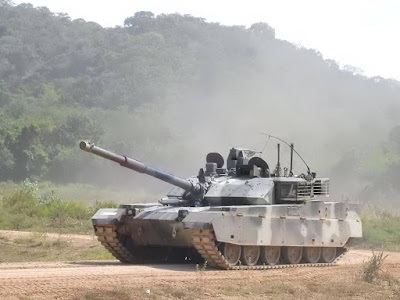 VT4 is a Chinese third generation main battle tank built by China North Industries Corporation (Norinco) for overseas export. 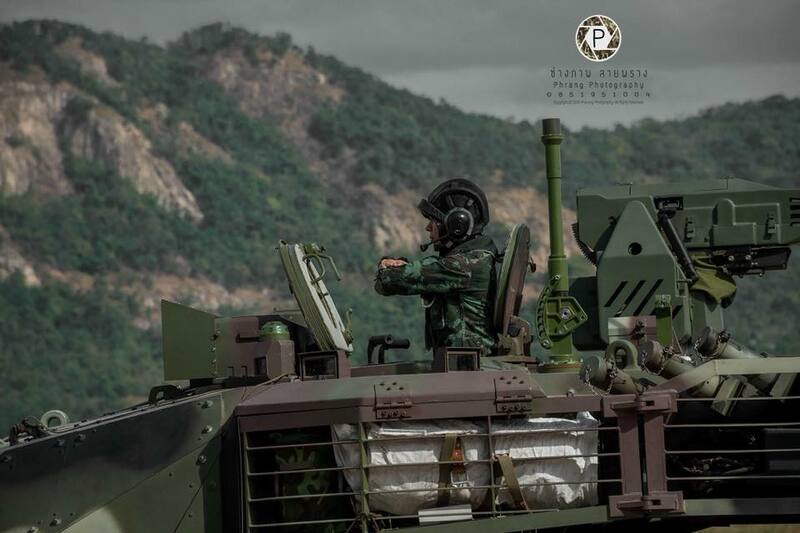 It is an upgraded variant of the MBT2000 (VT-1) and the latest tank model from the Type 90-II tank family. JawaPos.com -- Satu lagi burung besi memperkuat jajaran TNI AU di skuadron 32, Wing 2, Lanud Abdulrachman Saleh, Malang. 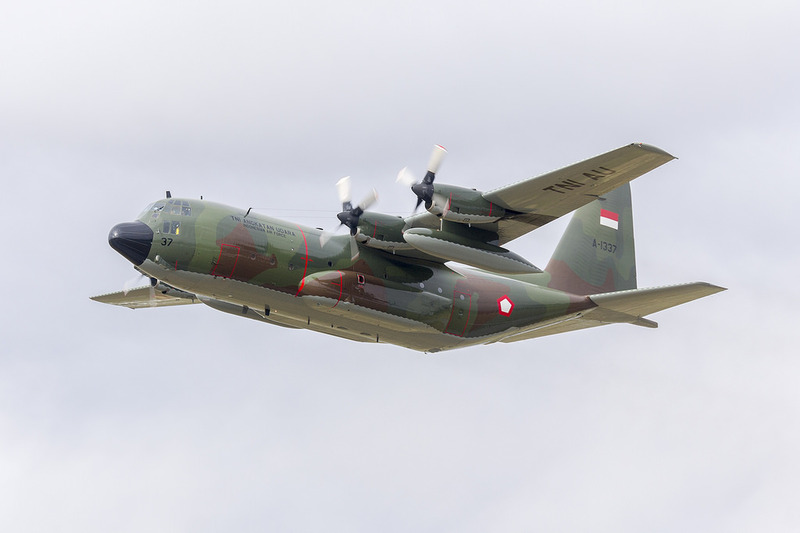 Yakni pesawat Hercules C-130H dengan nomor A-1337. Kepala Penerangan dan Perpustakaan (Kapentak) Lanud Abdulrachman, Mayor (Sus) Hamdi Londong Allo menjelaskan, pesawat ini baru datang dari Australia. Pesawat yang dipiloti Mayor (Pnb) Ari Susiono dan Kapten (Pnb) Gintoro W, serta Lettu (Pnb) Bagus P, telah tiba di parking area skadron udara 32 Lanud Abdulrachman Saleh, Pakis, Malang pada Kamis pagi, (21/12). Sementara itu, Danlanud Abdulrachman Saleh, Marsma TNI Julexi Tambayong, berpesan kepada air crew maupun groun crew serta seluruh warga Lanud Abd Saleh untuk senantiasa mengedepankan budayakan airmanship. "Serta laksanakan prosedur tetap sesuai SOP (standard operasional procedure) dalam kondisi apapun," tegas Julexi. Keunggulan C-130H antara lain terbukti dari kemampuan operasinya. 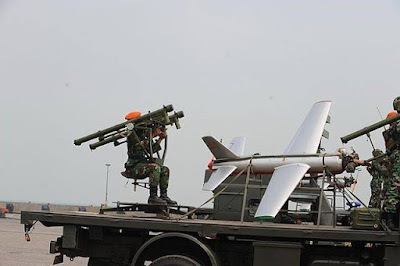 Mulai dari dukungan logistik, pasukan, bantuan kemanusian, operasi dan dapat terbang jarak jauh (long range). Penempatan C-130H di Malang karena Pangkalan Udara Abdulrachman Saleh sudah mempunyai fasilitas termasuk hangar, teknisi dan peralatan yang lengkap Hercules C-130 yang menjadi pangkalan induknya. 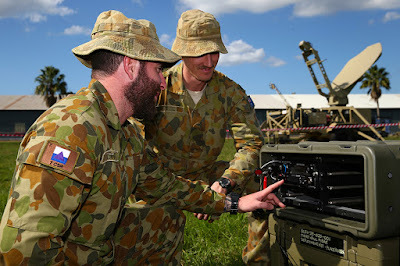 Brisbane - Ahead of schedule, Boeing [NYSE: BA] delivered the initial equipment of an Australian-designed and manufactured battlespace communications solution for the Australian Defence Force (ADF), a major milestone for a system that will transform how the Australian military communicates in the field. Under the AUD$650 million contract for the ADF’s Project Currawong, Boeing Defence Australia (BDA), a subsidiary of The Boeing Company, achieved Initial Material Release for the transit case version of its networked communications solution. The system transfers secure wideband voice, data and video services over wireless and wired infrastructure between Australia’s land-based deployed forces and headquarters. 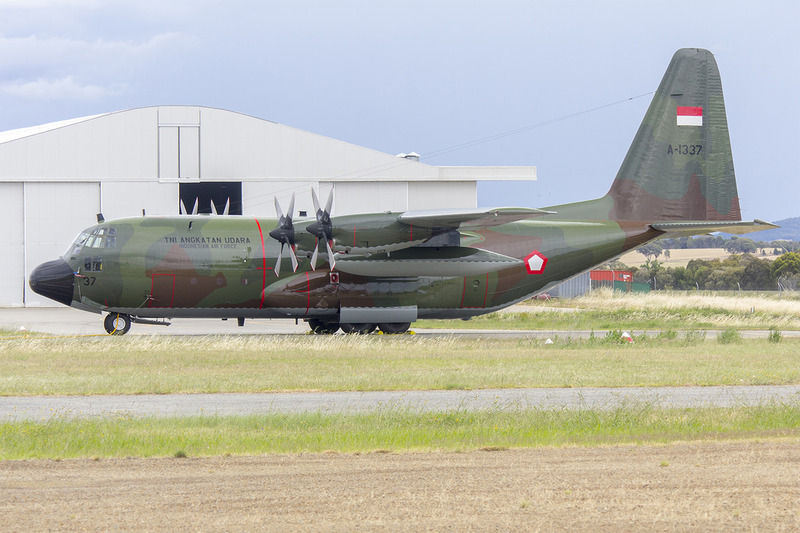 BDA Vice President and Managing Director Darren Edwards said the initial delivery ahead of schedule to the Commonwealth of Australia proved Boeing’s ability and agility in supporting the Australian Army and Royal Australian Air Force (RAAF). “Boeing’s success in creating the hardware and software that meets Australia’s battlespace communications needs within a complex fixed price development program is testament to our partnership with our customer as well as our growing Australian supply chain supporting this important capability,” said Edwards. Boeing has provided defence personnel from 7th Combat Signal Regiment and 1 Signal Regiment based at Enoggera Barracks and 1 Combat Communications Squadron at RAAF Base Amberley with training and equipment deliveries to use the system ahead of Exercise Hamel in 2018. This first tranche of the equipment delivered includes 18 deployable communication nodes and an Australian fixed strategic communications anchor site. This incorporates Boeing’s core communication system components, the network access module (NAM) and mission system management (MSM), which connect and manage the communication bearers and services Boeing and its partners are bringing to the program. Boeing will also design a vehicle mounted version of the solution in parallel with the ongoing rollout of the transit case version to additional Army and Air Force units. 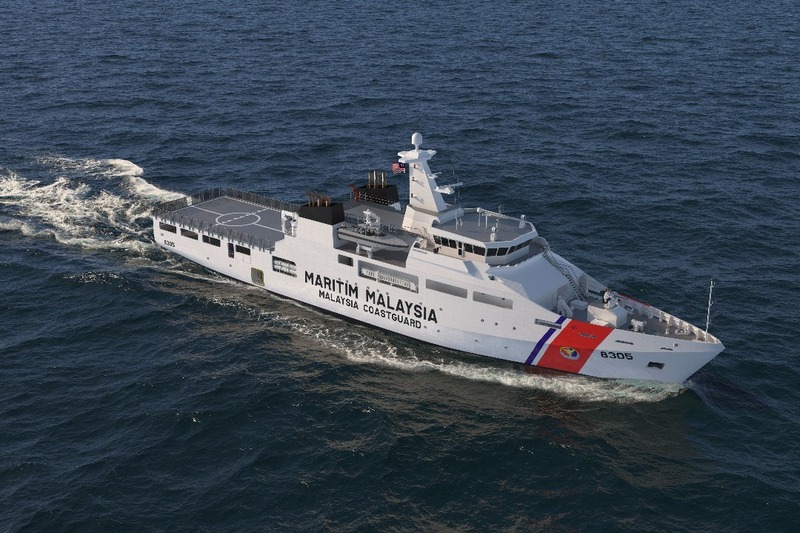 PETALING JAYA — The Malaysian Maritime Enforcement Agency (MMEA) will soon be able to protect the country’s coasts with a wider range, following the start of construction of three Offshore Patrol Vessels (OPVs). The keel of vessels, the Damen 1800-class designed in the Netherlands, were laid at the TH Heavy Engineering (THEE) Berhad shipyard at the Pulau Indah Industrial Park and will be completed at the cost of RM740 million. MMEA director-general Admiral (M) Datuk Zulkifli Abu Bakar told Malay Mail the vessels are a “game changer” and would help the agency cope with the myriad of threats in the country’s waters. “We have 256 assets at our disposal including ships and aircraft but these are insufficient for monitoring and enforcement of the country’s 614,158 sq km territorial waters. 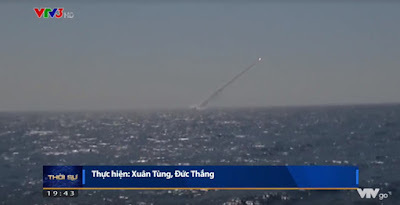 “This is why there has to be a constant flow of new and capable assets to maintain the ability for force projection beyond the shallows of our coasts,” he said. 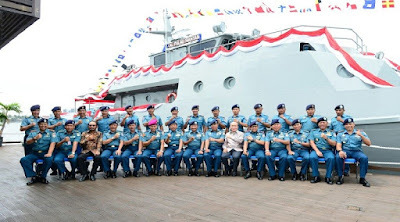 Zulkifli added that most patrol vessels operated by the agency are over 30-years-old and do not have the “endurance” or operational range for sustained operations. “The most critical element is that our assets lack the ability to persist at sea due to their short or limited operational range. This will change with the delivery of the new OPVs,” he said. THHE had prior to this built six of the Royal Malaysian Navy’s New Generation Patrol Craft. Measuring 83 metres long and nearly 14 metres wide the OPVs are able to conduct three-week patrols at a time and pack an Unmanned Aerial Vehicle in addition to their on-board 30 mm SMASH Remote Controlled Stabilised Naval Gun manufactured in Turkey. With a top speed of 21 knots, the vessels will be able to conduct operations up to the limits of the country’s Exclusive Economic Zone, making them effective against illegal fishing vessels that typically skirt the maritime border. They carry a crew of 70 with room for 20 passengers or suspects and are equipped with Fast Interceptor Craft for boarding inspections and search and medical facilities for rescue operations. The vessels are expected to be ready by February 2020. Delivery of the country’s first two missile-armed frigates, which are designed to be capable of engaging surface, subsurface and air threats, is still on track, acting Philippine Navy (PN) flag-officer-in-command Rear Admiral Robert Empedrad said late Wednesday. “The frigate [project] has not been delayed. Tuloy-tuloy siya and delivery time is still the same (first quarter of 2020) and we are going to process that,” he added. 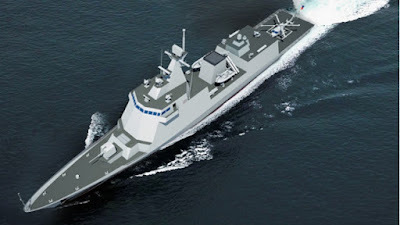 The Department of National Defense (DND) and Hyundai Heavy Industries signed a PHP18 billion contract for two frigates including its weapon systems and munition last October 24, 2016. But he admitted that the frigate program still has a lot of challenges to hurdle before being completed. Some of the issues include how to prepare and train PN personnel to man and operate these modern ships, where to dock them, and where to source the missiles and torpedoes which are the frigates’ main armaments aside from its main guns and secondary gunnery systems. The acting PN chief said that determining where to acquire these weapons is a big challenge as torpedoes alone takes two years to manufacture. “So we have to process that so that pagdating ng frigate ay may bala [na siya],” he added. As this develops, Empedrad expressed his thanks to President Rodrigo Duterte for naming him as the acting Navy chief following the relief of Vice Admiral Ronald Joseph Mercado after DND Secretary DelfinLorenzana cited lost of trust and confidence on the integrity and leadership of the latter. This was brought about by the alleged fixation of Mercado on one company to supply the combat management system (CMS) on the country’s frigate project. The CMS is the system which handles the weapons, sensors and other equipment related to combat. The bickering on what particular CMS manufacturer to utilize has delayed the frigate project by some four months, Lorenzana earlier said. Empedrad said he will be doing his job as PN chief and that he will do his best to keep the ongoing projects of the Navy moving forward. “I’m happy to be at the helm of the Navy, and I would ask all the members of the Navy, sailors and marines to, let’s work as a team so that we can move on with what we [en]vision for the Navy which is to be a strong navy and credible navy that our maritime nation will be proud of,” the acting PN chief said. RTAF demonstrates the LITENING pod along with the GBU-12 laser-guided bomb on board the Gripen fighter during the air operation demonstration in the annual Aerial Weaponry Competition. 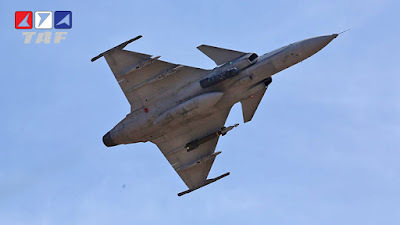 The LITENING pod was ordered for the Gripen at the same time with the Sniper AT that would be equipped on F-16. LITENING is a high-performance targeting pod that capable to equip on board various platform. It is reported that RTAF has 6 pods on their inventory. The New Zealand Defence Force’s decommissioning of replenishment tanker vessel HMNZS Endeavour on Friday has left the country relying on Australia for refuelling services until 2020. The tanker ship had been in service for 30 years, returning from its last deployment in June. Its replacement, HMNZS Aotearoa, will not be in service until January 2020. A Defence Force spokesperson told Radio New Zealand the Australian Navy would assist with refueling until HMNZS Aotearoa is in service. "The Royal New Zealand Navy works on a reciprocal basis with the Royal Australian Navy and other allied navies when it comes to providing fleet fuelling services and other operational requirements in circumstances such as this," the spokesperson said. "This shared resourcing is very common amongst partner navies." The co-operation between both nation's navies is not unusual, with Australia and New Zealand previously forming a joint task force for disaster relief operations, headed up by HMNZS Canterbury, which was, at the time, the only suitable vessel available to both navies. 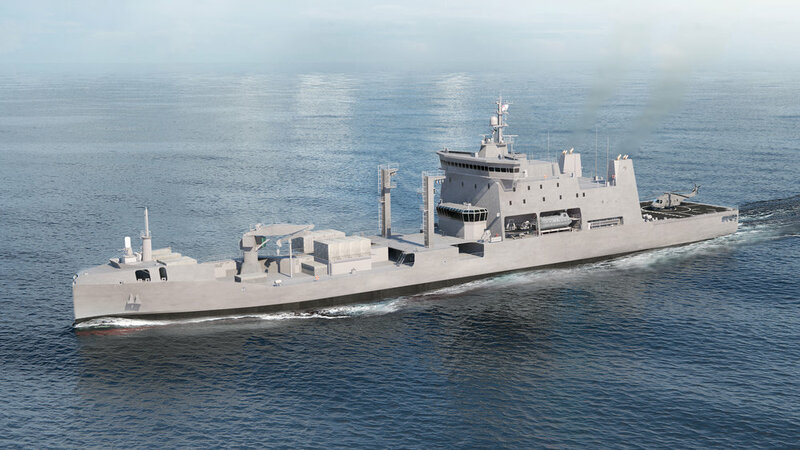 HMNZS Aotearoa, a 24,000-tonne vessel, will accommodate 64 crew and will be the largest ship ever operated by the New Zealand Navy. The vessel will have twice the displacement of HMNZS Endeavour and will carry 30 per cent more fuel. South Korean firm Hyundai Heavy Industries is building Aotearoa. Indonesia memesan tiga unit kapal selam dari Korea Selatan melalui mekanisme kerja sama transfer teknologi (ToT). Kapal selam pertama dan kedua yang dipesan Indonesia dibuat di perusahaan pembuatan kapal Korsel, DSME, sedangkan kapal selam ketiga dibuat di galangan kapal dalam negeri PT PAL Indonesia, Surabaya bekerjasama dengan DSME Korsel. Ketua Tim Pelaksana Komite Kebijakan Industri Pertahanan Sumardjono mengatakan bahwa Indonesia harus memiliki kemampuan untuk memelihara tiga kapal selam tersebut. Untuk itu, ToT dibutuhkan agar Indonesia bisa memelihara kapal selam tersebut di dalam negeri. Hal ini disampaikan Sumardjono usai bertemu Wapres Jusuf Kalla siang ini. "Ya harus lanjut, kerja sama ini kan bukan soal bangunnya tapi soal memeliharanya kan lebih penting. Kita harus mempunyai kemampuan memelihara," ujar Sumardjono di Istana Wakil Presiden, Jalan Medan Merdeka Selatan, Jakarta Pusat, Rabu (20/12). "Kalau kita mempunyai kemampuan memelihara, maka tingkat kemampuanya tinggi karena kapal selam ini kan operasi terus kan gitu, arahnya ke sana," sambung Sumardjono. Sumardjono mengatakan bahwa Indonesia membutuhkan teknologi tersebut. Di samping dapat melakukan pemeliharaan secara mandiri, diharapkan dengan penguasaan teknologi tersebut, Indonesia mampu meningkatkan kesiapan kapal selam dalam menjalankan tugas. "Infrastruktur kita sudah siap untuk melakukan perbaikan itu. Kalau untuk bangun ya perlu sedikit lagi, kan sayang kalo gak dimaksimalkan." "(ToT) tetep dilanjutkan dulu, biar fokus sehingga kita mendapatkan teknologinya banyak sehingga sewaktu-waktu melakukan perbaikan lebih confident tidak tergantung orang lagi, artinya kemandirian," pungkasnya. 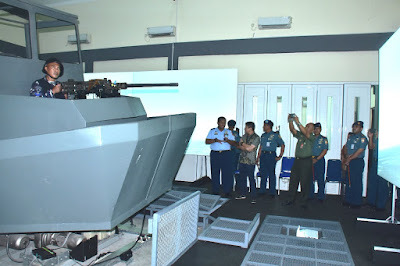 The Indonesian Navy (Tentara Nasional Indonesia – Angkatan Laut, or TNI-AL) has reduced the number of submarines it will require under the Minimum Essential Force (MEF) armed forces modernisation blueprint. 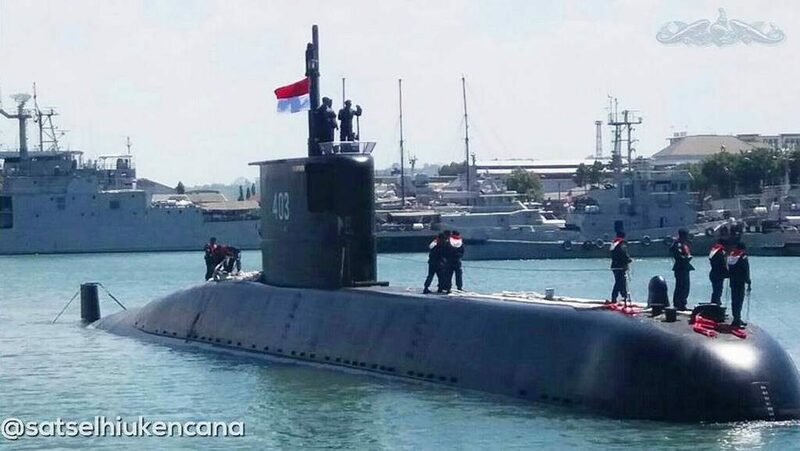 Multiple sources from within the service’s headquarters in Cilangkap, East Jakarta, who are privy to details of these discussions that took place at the flag officers level, have confirmed with Jane’s that the original requirement for 12 submarines by 2024 as stipulated under the MEF blueprint has now been reduced to eight. 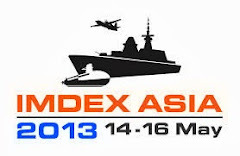 Given the revised requirements, Indonesia now needs to acquire just three more boats by the deadline set under the MEF. The TNI-AL currently operates a fleet of two German-built Cakra (Type 209/1300)-class diesel-electric submarines (SSKs) that were commissioned in 1981, and one Nagapasa (Type 209/1400)-class boat, which was built by South Korea's Daewoo Shipbuilding and Marine Engineering (DSME), and inducted in August 2017. The service is currently anticipating the delivery of two more Nagapasa SSKs from DSME, the last of which is scheduled for commissioning in 2021, and is now in the process of establishing final requirements that will subsequently lead to an acquisition programme for further boats. 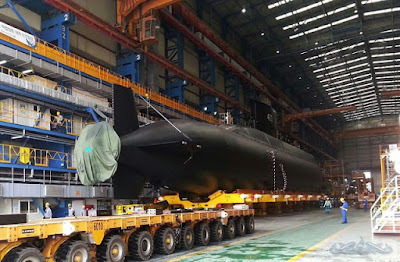 As reported by Jane’s since April 2017, the TNI-AL has also received a pitch from Turkey’s Gölcük Shipyard to supply a variant of the Reis (Type 214)-class SSK with air-independent propulsion (AIP) technology. Other options considered by the country include the ‘Kilo’ class from Russia, and a variant of the Scorpene 1000 from France’s Naval Group.